1 of 4 Heat oven to 450 degree F. Coat a baking dish with nonstick cooking spray. 2 of 4 Cook rice following package directions, about 25 minutes, replacing water with the broth and adding 1 teaspoon of the jerk seasoning. Gently stir in kidney beans during the last 5 minutes of cooking. 3 of 4 Meanwhile, cut the chicken into 1-inch pieces and toss with remaining 3 teaspoons of jerk seasoning. Place in prepared pan and bake at 450 degree F for 15 minutes or until internal temperature reaches 160 degree F on an instant-read thermometer, turning once halfway through. 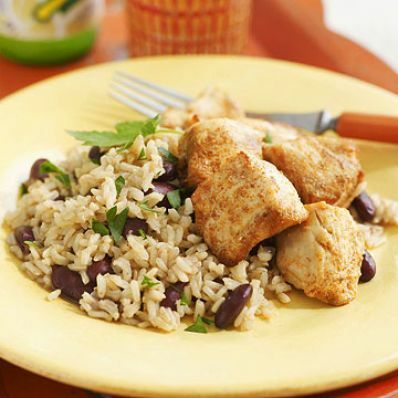 4 of 4 Serve the chicken with the rice and beans on the side. Per Serving: 487 kcal cal., 12 g fiber, 99 mg chol., 1 g sat. fat, 59 g carb., 4 g Fat, total, 52 g pro.